I last reported on usage stats back in February, when Windows 7 had finally tipped the scales to become the OS used by the majority of Paint.NET users. I’m going to use a briefer format this time and just report on the OS and CPU stats so that I can spend more time on another blog entry (in other words, no table and no language stats this time). Windows 7 has hit 55.75% (previously 44.74%), XP has fallen to 32.99% (previously 39.57%), and Vista has tumbled to only 10.98% (previously 15.55). And in other good news, 64-bit has jumped all the way up to 34.26% (from 26.08%), while only 65.74% of Paint.NET users are trucking around with a 32-bit version of Windows (down from 73.92%). If you haven’t migrated to 64-bit yet, I highly recommend doing so! And also be sure to install the latest service pack for the version of Windows that you’re using (SP3 for XP, SP2 for Vista, and SP1 for Win7). Of the Windows 7 users, 37.70% are using the “RTM” version and 62.23% have upgraded to SP1. Of the Windows Vista users, 19.14% are using SP1 while 79.40% are using SP2. Only 1.40% are using RTM (possibly due in part to having dropped RTM support awhile ago). Of the Windows XP users, 2.63% are using SP2 while 97.34% are using SP3 (possibly due in part to having dropped SP2 support awhile ago). 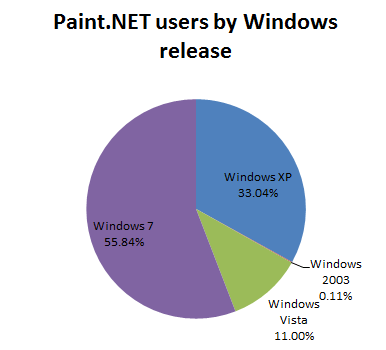 About 98% of the user base is using Paint.NET v3.5.3 or newer. And maybe we can start using new, powerful Paint.NET tools in the future? Rick, you really need to divorce your faulty data gathering system before someone accuse you of lying. The stats I list above are for the Paint.NET user base, not the general web browsing population. The links you provide are for completely different sets of users. I can’t imagine why you would think others’ stats for web page visitors would or should be the same as the stats for the Paint.NET application. And maybe you should stop throwing around words like “faulty” and “lying” before I push the spam button and forever banish your stupid comments. Paint.NET user base? How do you know who has Paint.NET and who does not? And why do you keep posting stats when you are forcing people people to choose between Paint.NET or Windows 7? What are you trying to prove with these stats? “Paint.NET user base” as judged by the number of pings to the update manifest text files. I don’t know anything about who has Paint.NET and who does not. It is 100% anonymous. I’m not sure what you mean by your 2nd paragraph. I’m not forcing people to choose between anything, and I’m not trying to prove anything. These stats posts are basically just for fun. I was facepalming quite a bit whilst reading this. Anyway, how do I migrate to 64bit? Do you just need to buy a 64bit OS or do you need a 64bit processor or what? I’m not really sure what 64bit is referring to. I think these stats are lies. Windows XP remains the most popular OS out there. No one I know uses Windows 7, and those that had it, went back to XP. How hard is it to see that you’re clearly shilling for M$ by forcing Windoze 7 on your user base. It doesn’t matter as in a few years everyone will be using Macs. M$ should just go back to supporting XP and after everyone has switched to the iPad, close up shop. What a bunch of loosers. That should be a Youtube comment, who knows? You may even get thumbs up. I am a little surprised 37% of your users are still stuck with the pathetic, ugly, insecure and crappy XP. In North America, Europe, Oceania etc. XP has less than 30% usage share, while Windows 7 has over 45%. Nobody I know — my friends, family and colleagues use XP. I think it was a GREAT decision for you to drop support for the pathetic XP from PDN 4.0. > pathetic, ugly, insecure and crappy XP. Could you please elaborate on each on these topics, especially on “pathetic” and “crappy”? Wow, that sums up to something like 15-20% of the world population. Worldwide XP has just 36% share while Windows has 42%. But in all the countries where GENUINE versions of Windows is used, XP has less than 25% market share. ONLY in China XP has 75% share. But 99% of Chinese monkeys use pirated copies of Windows. So they don’t count. XP is dead as a dodo in the developed world. Now, let’s go to the crappy and pathetic part. It’s because XP has unproductive UI and search feature. For example, XP doesn’t index the CONTENTS of my files. In Windows 7 I index my ENTIRE hard drive. So I just type anything I remember about a file, and the file pops up. On the pathetic XP I had to remember thousands of files by name. XP had no start menu search, so I couldn’t launch apps quickly. I had to use the crappy and stinky Start Menu list. On Windows 7 to launch Excel, I just type “Ex” and bingo. XP had no search box in the Explorer window. So it was unusable. XP had no Breadcrumbs Bar in the Explorer Address bar. So I had to use the crappy UP button. XP had no Library or Stack suppot for organizing files. XP had the pathetic tiny taskbar with no jumpslist, icon overlays, progress bar. XP had no Protected Mode support in Internet Explorer. XP had no User Account Control. XP had pathetic security with no ASLR. Windows 7 NEVER gets infected. XP got slow as molasses within 3 months. My Windows 7 has shown no signs of slowdown even after 2 years. XP had pathetic fonts in the UI. Windows 7 has the GORGEOUS Segoe UI font. XP had no support for Aero Snap, so I had click those tiny Maximize buttons instead of quickly snapping the Window. XP is a usability and security disaster. That’s why the ENTIRE world has abandoned XP. It already has less than 30% market share. Within 12 months it will have less than 5%. > Worldwide XP has just 36% share while Windows has 42%. By Windows you mean Vista+Seven? > But in all the countries where GENUINE versions of Windows is used, XP has less than 25% market share. > ONLY in China XP has 75% share. But 99% of Chinese monkeys use pirated copies of Windows. So they don’t count. But then why don’t they use pirated copies of Seven? Surly, if you it costs you nada you go the “latest and greatest”. > XP is dead as a dodo in the developed world. > XP doesn’t index the CONTENTS of my files. In Windows 7 I index my ENTIRE hard drive. So I just type anything I remember about a file, and the file pops up. On the pathetic XP I had to remember thousands of files by name. You do know that Indexing Service was there since NT 4.0 and the only difference is that since Vista it is enable by default? > XP had no start menu search, so I couldn’t launch apps quickly. I had to use the crappy and stinky Start Menu list. On Windows 7 to launch Excel, I just type “Ex” and bingo. Well, this is kinda purpose of a GUI: use mouse and icons to organise your desktop. It is up to everyone to use it to its best. If you want to type use the command line interface. Otherwise use keyboard shortcuts. > XP had no search box in the Explorer window. So it was unusable. > XP had no Breadcrumbs Bar in the Explorer Address bar. So I had to use the crappy UP button. And what’s wrong with directory tree? >XP had no Library or Stack suppot for organizing files. So as long as the user take a minimal care and memory as to where he puts the documents it is not actually needed. Stacks are really just a filtered, folder-specific form of searching. >XP had the pathetic tiny taskbar with no jumpslist, icon overlays, progress bar. And all these features only work if the program use this new API. >XP had no Protected Mode support in Internet Explorer. > XP had no User Account Control. The one that slows down the computer and was specifically created to annoy users because of sloppy developers that expect all their programs to run with administrative privileges? > XP had pathetic security with no ASLR. The one that requires specifically compiled binaries and have weakness in it’s implementation? > Windows 7 NEVER gets infected. > XP got slow as molasses within 3 months. My Windows 7 has shown no signs of slowdown even after 2 years. Now here I’m impressed: someone running Seven since day 1! As for slowness, when XP is used for work, with no/minimal hardware/software changes, it also runs for years. Just run defrag from time to time. http://www.dailybits.com/windows-xp-tips/ Again, the defrag was here since W2k, it was just turned on by default since Vista. >XP had pathetic fonts in the UI. Windows 7 has the GORGEOUS Segoe UI font. The pathetic font is called Tahoma. As for the appreciation, it is really up to individual tastes, unless you have something more tangible than “gorgeous”. > XP had no support for Aero Snap, so I had click those tiny Maximize buttons instead of quickly snapping the Window. You do know that you can customise GUI widgets, including their size? > XP is a usability and security disaster. >That’s why the ENTIRE world has abandoned XP. > It already has less than 30% market share. > Within 12 months it will have less than 5%. How much are you ready to bet on that? Oh jeez, cut it out already. From now on any childish posts like these will not be approved. I’m sorry, but weren’t you the one who chastised the developer on Neowin for dropping XP support? Aren’t you the one who was constantly whining that XP should have been saved and re-developed? Unless my sarcasm radar is of calibration. Or maybe it’s someone using the name “tuxplorer” in an attempt at some kind of … irony?